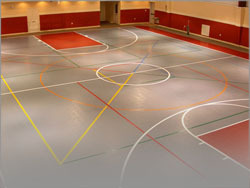 Multi-use Gymnasium Flooring Options from Supreme Sports for Rec Centers & Schools in Chicago, IL. Once upon a time, gymnasiums were used for basketball and little else. My how times have changed. Multi-purpose is the name of the game today, and Supreme Sports was designed with multi-use in mind. Supreme Sports's low impact, high performance, and economically attractive surface is the perfect alternative to standard and expensive hardwoodgymnasium flooring. Supreme Sports's Chicago gym flooring is made from an exclusive material. A state-of-the-art modular wood laminate aerobics flooring, it features the dual advantages of being tougher and more durable than traditional hardwood floors, yet more forgiving and less stressful on the body. The highest weight per square inch and the thickest top of any modular flooring means a floor that will remain in top shape for years to come, and tight seams and staggered installation promise optimum conditions for basketball, volleyball, and other gymnasium sports. 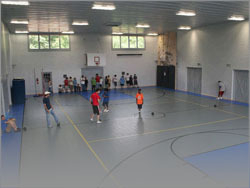 Each gymnasium needs its own unique look and feel, particularly if it's affiliated with a school and its corresponding team colors. Choose from a wide variety of colors with no fillers or additives, and rest easy knowing that Supreme Sports's gymnasium flooring comes with a 10-year Manufacturer's Warranty. Add it up and you'll find a gymnasium flooring option where the lows (low impact and low maintenance) are every bit as attractive as the highs (high performance).